With the addition of the featherweight fight between Mike Brown and Daniel Pineda, the 12-bout lineup for “UFC 146: Dos Santos vs. Overeem” is now complete. MGM Grand Garden Arena in Las Vegas, Nevada hosts the May 26th festivities. 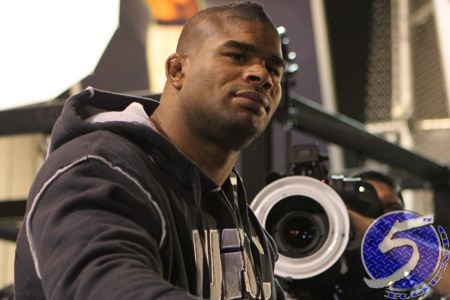 Alistair Overeem (Pictured) challenges freshly-minted heavyweight champ Junior dos Santos for his crown in the show’s featured attraction. The shootout will be proceeded by four other 265-pound contests. UFC 146 marks the first time in company history where all five pay-per-view scraps will consist of heavyweight action. A top contender tango between Cain Velasquez and Frank Mir serves as the co-main event.